While currently property values are falling in many locations, the Brisbane property market seems to be steadily gaining pace. This means more investors are now looking for opportunities in Brisbane where properties are more affordable, rental yields are relatively higher and future prospects for the market look bright. Is the Brisbane property market a good place to invest? Like most things in real estate the answer is – it depends. It’s true that Brisbane is likely to be the best performing property market over the next few years, however while some locations in Brisbane have strong growth potential, and the right properties in these locations will make great long term investments, certain submarkets should be avoided like the plague. To help you make an informed decision, I’m going to examine what’s going on in the Sunshine State in detail in this blog. But be warned…it’s a little longer than normal, so if you’re looking for a particular element of the Brisbane property market, use these links to skip down the page. What Brisbane areas are worth investing in? 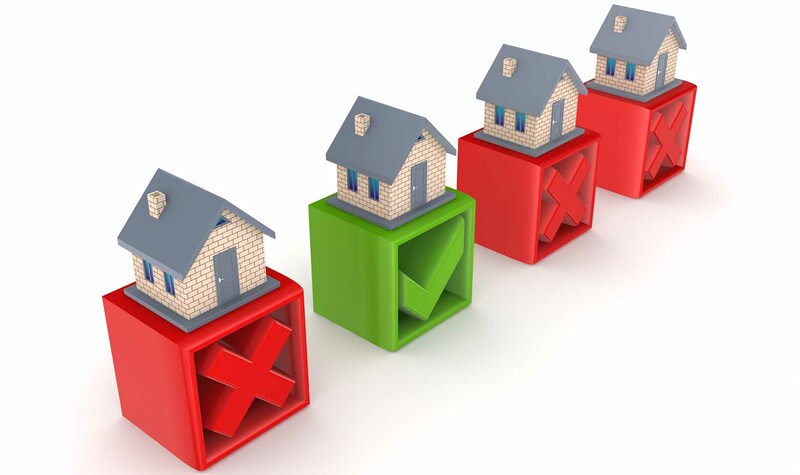 How do I choose a strong investment property in Brisbane? There are multiple markets in this diverse sprawling city; divided by geographic location, price point and property type. Currently some markets are hot, while others are not. 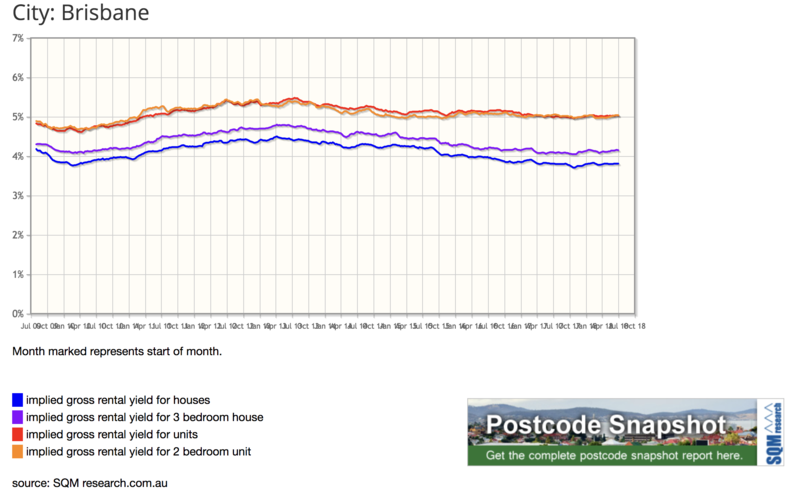 I’m talking about the property market Brisbane – not the Queensland property market. Dwelling values were virtually unchanged for the Brisbane Property Market with 0.1% growth over the past three months and they are up three tenths of a percent over the first eight months of the year. 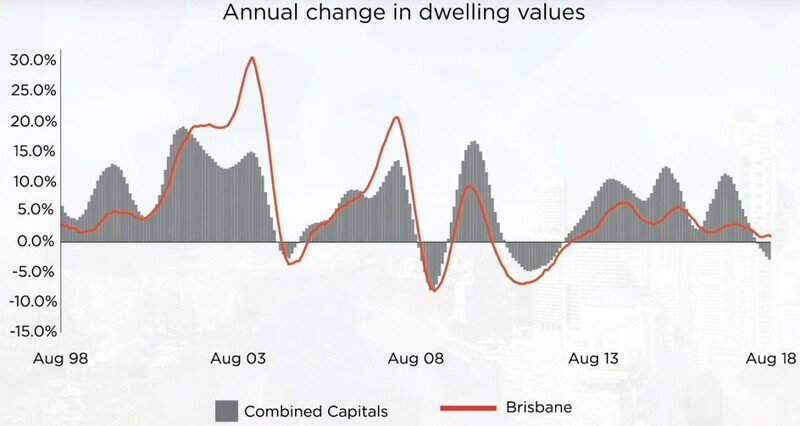 Having said that many of the properties purchased for clients of Metropole’s Brisbane office showed double digit capital growth over the past 12 months – that’s how averages work isn’t it Some properties over perform while others underperform. The general slowdown in capital gain comes despite population growth ramping up and the Queensland jobs market showing a marked improvement relative to previous years. The Brisbane apartment market has been the focus of much negative attention due to excessive supply levels, however recently Brisbane unit values have started to edge a bit higher, which may be a signal this sector of the market has bottomed out. Unit construction peaked in late 2016, so supply concerns are starting to become less pressing. The Brisbane LGA annual median house price grew 3.1 per cent to a new record of $670,000 in the March 2018 quarter, according to the the REIQ -this is the median house price – units pulled down the median dwelling (combined) price growth. Against a backdrop of cooling southern markets and falling listings volumes, the Brisbane house sales market demonstrated admirable resilience, buoyed by steady population growth driving demand and underpinned by good economic fundamentals. Speaking of the Brisbane property market REIQ Media and Communications Manager Felicity Moore said anyone thinking of selling was going to find willing buyers in good supply. “In this market we could potentially see a rise in off-market sales as eager buyers pressure sales agents to see property before it hits the market,” she said. Ms Moore said that the unit market was at the tail end of an unprecedented level of supply. Rising demand would undoubtedly absorb excess stock, the only question remaining was just how long that would take. “Queensland has become the number-one destination for internal migration, taking over from Victoria in the latest ABS Census data, and our overseas migration is at its highest level in years, which means demand for accommodation will continue,” she said. As always, the market will remain fragmented. In the last year alone some areas underperformed, 68 suburbs far exceeded the average level of growth and almost a dozen Brisbane suburbs had double digit price growth over the last year. 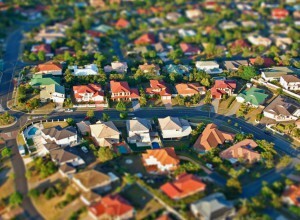 The good news for property investors is that rents are slowly on the way up in Queensland. According to the SQM, Brisbane’s gross rental yield for houses was around 4 per cent and for units was closer to 5 per cent. While Brisbane property prices are considerably more affordable than the other 2 east coast capital cities, Corelogic forecasts that one in 10 houses sold in Brisbane will fetch more than $1 million within 2 years. The Brisbane property market is likely to record positive grow in the order of 3% to 5% this year as the underlying market drivers are now strengthening. 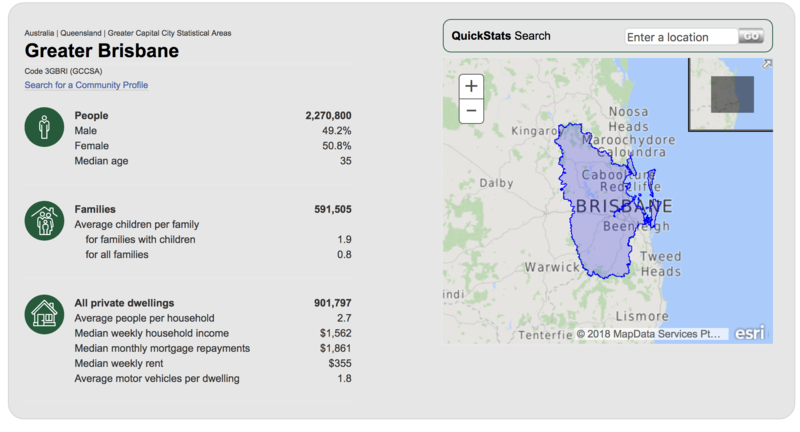 BIS Oxford’s 3 year forecasts to 2021 suggest that Brisbane will see the strongest growth of any property market over the next three years, jumping 13 per cent to a median of $620,000. They expect Brisbane’s property market to continue to perform well at a time when many other markets are languishing. The affordability factor, with Brisbane’s median house price now far lower than Sydney and Melbourne, as well as higher rental returns, is likely to drive more interstate investment into the city. Local affordability and the lifestyle advantages has resulted in strong interstate migration (+17,426 last year) up 50.5% from previous year. At the same time 12.7 percent of our overseas migrants are settling in Queensland and interest from foreign investors is rising. Houses in Brisbane’s inner and middle ring suburbs offer the best prospects of long term capital growth. According to the Australian Bureau of Statistics 2016 Census the population of Greater Brisbane which encompasses the local government areas of Brisbane, Logan, Ipswich, Redcliffe and Moreton Bay is 2,270,000. This is less than half the population of it’s southern east coast cousins – Sydney and Melbourne. According to the 2015 Intergenerational Report the population of Australia is expected to almost double by 2055, with Queensland also becoming home to more than seven million people over the next 40 years. Given its sub-tropical climate, the region is well known for its laidback lifestyle and enviable weather. Greater Brisbane also has far more affordable property than the southern cities of Melbourne and Sydney. Brisbane, is a sprawling city with outlying suburbs up to one hour drive from the city centre. Sprawling along the Moreton Bay floodplain, Brisbane stretches from Caboolture in the north, to Beenleigh in the south, and as far as Ipswich in the west. Winding around the Brisbane River the city is rather hilly, with prominent rises including Mt Coot-tha, Enoggera Hill, Mount Gravatt, Toohey Mountain and Highgate Hill to name a few. The Central Business District itself is fairly well laid out but it can be tricky to navigate through with all the one way. If you ever get confused a golden rule for the CBD is that the streets with female names (Margaret, Ann, Queen etc.) run parallel to each other and the streets with male names (Edward, George etc.) also run parallel to each other. The CBD is still in the original settlement location in a curve of the river about 23 kilometres upstream from Moreton Bay. The river acts as a natural divide with the city colloquially broken into two sections, namely “north of the river” and “south of the river”. The inner-ring of suburbs of Brisbane are classed as between zero and five kilometres from the CBD, the middle-ring from five kilometres to about 12 kilometres and the outer-ring from the point to the start of the borders of its Greater Brisbane’s regional councils. In spite of the hilly areas of Brisbane, much of the city exists on the low-lying flood plains, with several suburban creeks throughout the suburbs joining the Brisbane River. These low-lying areas on the water’s edge increase the risk of flooding. There are many multi-million dollar projects happening in and around Brisbane at the moment, that are starting to create jobs and more importantly get the economy rolling again. One of the biggest would have to be the addition of a second runway to the Brisbane Airport and you would hope so too, at a total cost of around $1.3billion. Capitalising on opportunities from the Asian Century, there are many major tourism projects with a combined value of $30 billion scattered up and down Queensland’s coastline. New resorts – and upgrades of existing resorts – are slated for Brisbane, Ipswich, the Gold and Sunshine coasts, Rockhampton, Mackay and Cairns. While new infrastructure is an important element for investors to consider, it doesn’t necessarily lead to property price increases and sometimes can be detrimental to an area through increased traffic, noise or pollution. While all the economic key pointers are heading in the right direction, it is the Queensland Economy that needs to kick into action. Brisbane is Queensland’s economic engine room – a growth city with a strong history of economic performance and significant infrastructure investment. According to the Brisbane City Council economic fact sheet Q2 2014, Greater Brisbane’s economy has rapidly expanded to be worth $135 billion, representing 47.1 per cent of Queensland’s economic output in 2012-13. Despite global uncertainty, the economy is predicted to be worth more than $217 billion by 2031, according to the Brisbane City Council Economic Development Plan 2012-2031. 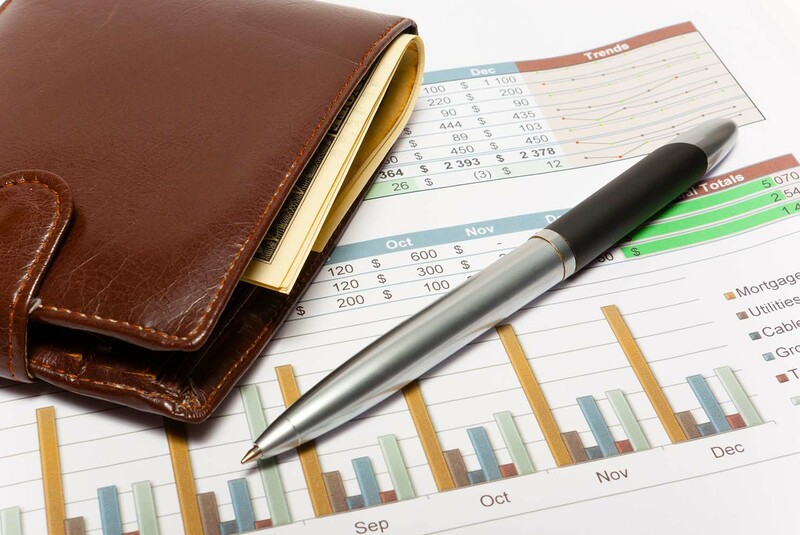 Queensland Treasury and Trade believe the State is perfectly positioned to capitalise on this and consequently its economy is expected to grow by six per cent in 2015-16. According to the Queensland Government’s Mid Year Review 2015-16, the economy is growing by four per cent and jobs growth has also rebounded, albeit more slowly than projected. The population of Greater Brisbane is expected to experience solid growth over the coming 10 years according to a report by Place Advisory. The Australian Bureau of Statistics has predicted strong population growth at an average of 62,410 people in Brisbane per year over this period. In 2018, the growth rate is projected to be 2.3% decreasing to 2.1% in 2026 and remaining steady. 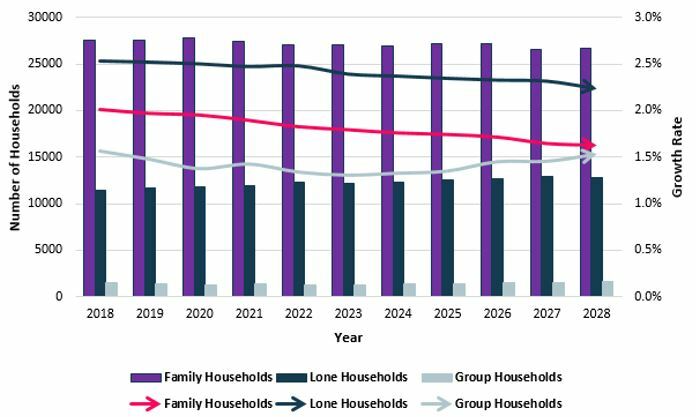 Whilst, family households are expected to see the largest increase over the next 10 years, the Australian Bureau of statistics projects that lone person households will have the highest growth rate leading into 2028, averaging a 2.4% increase per annum. This is followed by family households which have a projected average growth rate of 1.8% per annum over the same time frame. Group households are set to see the smallest growth rate at an average of 1.4% per year. Given its sub-tropical climate, Brisbane is well-known for its outdoor lifestyle, especially the plethora of dining options along the Brisbane River in residential and restaurant precincts such as Teneriffe, Bulimba, New Farm and West End. Brisbane is no longer a “big country town” in fact it’s a veritable hotbed of cultural and creative offerings, festivals and events, according to experts. Exclusive blockbuster exhibitions and inspiring theatre productions sit alongside independent and emerging local performances, outdoor cinema, street art and intimate gallery and performance spaces. Lovers of comedy, musicals, live theatre and dance head to the Brisbane Powerhouse and QPAC. The Queensland Museum and QAGOMA offer free entry to permanent exhibitions. Fortitude Valley and West End are go-to destinations for local live music gigs and DJs, while international acts visit the Brisbane Entertainment Centre or Suncorp Stadium. And while Brisbane is Australia’s third largest city, tenants don’t necessarily want the same features as renters in Sydney and Melbourne. So where should an investor start looking? That’s why I only invest in areas where the locals’ income is growing faster than the national averages. Think about it… in these locations locals will have higher disposable incomes and be able to and should be prepared to pay a premium to live in these locations. Many of these locations in Brisbane are the inner and middle ring suburbs which are gentrifying as these wealthier cohorts move in. There are great investment opportunities in these suburbs in houses and townhouses. While the Brisbane property market has been generally subdued compared to the other east coast capitals, of course there is not one Brisbane property market and as you can see from the table below, these top 20 Brisbane suburbs all grew at an average of more than 7% per annum which meant property values more than doubled every 10 years – if you bought in the right suburb – and then of course you had to own the right property in that suburb. This forms part of the research data we use at Metropole to help our clients find investment grade properties, or A grade homes for owner occupation. Overall the various suburbs in Queensland show a dramatic range in performance, highlighting both the diversity in housing stock around the State, and no doubt that next twenty five years will show an equally diverse result. There’s no doubt that proximity to popular education catchments influences property prices in Brisbane. This is true of both primary and secondary school catchment zones, which have in general outperformed the market and are likely to continue to do so. 11. Look for Brisbane’s best properties in the inner- and middle-ring suburbs. Research shows that those suburbs close to the city centre generally perform better than all others over the long-term. Our research at Metropole shows that (in general) properties closer to the CBD and closer to water increased in value faster than those further from the CBD and further from water. And this general trend has again been confirmed by a paper by the Australian Housing and Urban Research Institute, which found that both in percentage terms and in absolute terms over the long haul suburbs located reasonably close to the CBD, where demand is high, close to employment and where the most people want to live and where there’s no land available for release, outperformed the outer suburbs. One of the significant changes to occur in Australian cities over the past 50 years, and which has pushed up inner- and middle-ring suburb property values, is gentrification. Interestingly this wasn’t caused by deliberate planning policy, but resulted from a set of demographic changes that have occurred in most major capital cities around the world. Later, our changing demographics with declining household size, in part because we were getting married later and having fewer children, meant that small inner suburban dwellings or apartments provided ideal accommodation for the expanding cohort of professionals who worked in or close to the CBD. 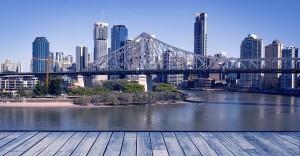 You may also want to watch this video: 5 Important Things Interstate Investors Need To Know Before Investing In Brisbane. There has been a large increase in the number of off-the-plan units built in Brisbane over recent years. With the supply of new and off the plan apartments in Brisbane’s CBD and inner ring outstripping demand, and estimates of another 15,000 apartments flooding the Brisbane market in the next year, there is little prospect of capital growth or rental growth in Brisbane’s apartment market in the near future. There are about 19,800 apartments that are either under construction or being marketed within the inner-city precincts of Brisbane. I can see the situation where some off the plan purchasers will have to wait up to a decade for capital and rental growth. Currently the Brisbane property market is being infiltrated by Sydney investors ‘buying blind’. With Sydney property prices having risen strongly over the last few years and now that the market has slowed down from it’s frenetic pace, these high prices plus tighter banking regulations limiting investor’s budgets has caused many Sydneysiders to follow the sun north and look for property investment opportunities in Queensland but many are making a big mistake. According to an article in Domain Sydney investors are increasingly buying properties in Brisbane solely on photographs and skipping inspections. And they’re buying the wrong properties in the wrong location based on price. “…blind-buying Sydney investors had flooded into the Logan market. “Out of every 10 sales, five will be investors, and two will not have viewed the home, and that is a modest estimate. The moral of the story is don’t risk purchasing site unseen unless you have a trusted representative review the property on your behalf. I’m a big believer in buying property for below its intrinsic value – that’s why I avoid new and off the plan properties, which generally attract a premium price tag. Remember, though, that you’re not looking for a ”cheap” property (there will always be cheap properties around in secondary locations). You’re looking for the right property at a good price. Properties to consider may be ones that are a little ugly or untidy but have good “bones” and are in good or superior locations. Some of Brisbane’s middle-ring suburbs may be worthwhile considering given they often have solid homes on land sizes ranging from 405 to 600 square metres. Look for an area that has a long, proven history of strong capital growth and is one that is likely to continue to outperform the averages. This is largely because of the demographics in the area. These suburbs tend to be those where a large number of owner occupiers desire to live in the area, because of lifestyle choices of offer. I look for suburbs where wages (and therefore disposable income) is increasing above average. This translates to being an area where locals are able to and prepared to pay a premium price to live there, putting a financial floor under your investment property. This is also considered to be gentrification. So what we’re seeing is high-income people moving into particular locations, which perhaps used to be considered blue-collar, and spending their money there in new cafes and on renovating their homes. In Brisbane, for example, there are a number of inner-city suburbs where there is occurring such as Annerley and Woolloongabba on the south side. An investment must have something unique, or special, or different or scarce – some ‘X factor’ that makes it stand out from its neighbours – in order to land on my shortlist. So when your looking at the Brisbane property market, consider properties that are “special” because of their design, e.g. perhaps Queenslanders or art deco apartments or properties in desirable locations. 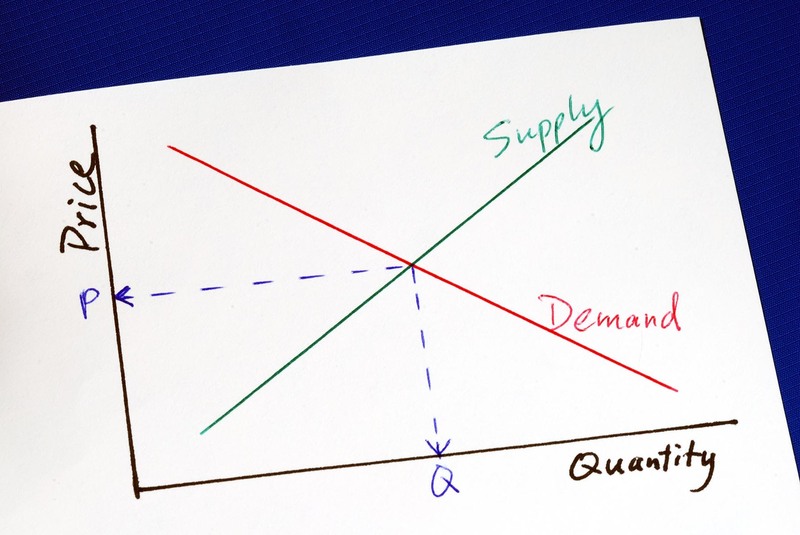 Remember that more demand than supply always means higher prices.because of that scarcity factor. An ideal investment is one in which you can manufacture capital growth through refurbishment, renovations or redevelopment. For example, there are tens of thousands of properties out there that could all have their values increased through simple renovations. While I don’t believe that investors should subscribe to the “buy, renovate, sell” philosophy, because the opportunity to profit is not great, what works really well, if done correctly, is a buy renovate and hold your investment property. Here you buy a property with renovation potential, renovate and then keep it as a long-term investment having added value. This added value will give you improved rentability – your property will be more attractive to a wide range of tenants – as well as achieving a higher rent and you will have “manufactured” some equity. To me, the picture is clear. 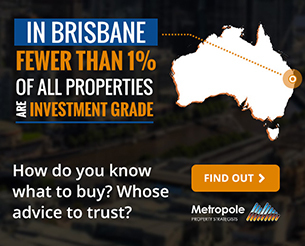 Your biggest challenge is to find the right property to buy, but that’s what the Brisbane team at Metropole specialise in.